It’s been another one of those summers, just like pretty much every summer now, one of those summers in which by the middle of June I can just barely meet deadlines for paid work and can’t think about doing any research for fun or even soliciting more paid work, in which it’s still swampy in mid-October and my list of things to do once the weather is bearable has become so overstuffed that even the crisp relief of autumn has an early pall over it. A summer in which Laugh-In‘s Judy Carne dies and the obituaries make her autobiography sound frank and compelling, so that I go downstairs at the library where I work and find that someone else has had the same idea and checked out the only copy. A summer in which I notice that the next shelf over is amply stocked with copies of Edd Byrnes’s 1996 autobiography, “Kookie” No More, and I figure: Ah, what the hell. Why not? For much of the general public, skimming the turgid prose of victory-lapping celebrities might be as pleasurable as abdominal surgery, but in my line of work, if that’s what you want to call it, it’s an inoffensive pastime that occasionally yields useful facts or avenues of inquiry. (Sample trivia: Steve Trilling, the yes-man whose name adorned a million memos that I read during my college days as a page in the USC Warner Bros. Archives, committed suicide in 1964, immediately after Jack Warner fired him.) Even though he is refreshingly forthright and unapologetic about his gay-for-pay days before Warner Bros. made him a TV star, Edd Byrnes comes across in his pages as precisely the same sort of glib and uncomplicated personality that he projected during his salad days of playing Kookie, the hep-talking, self-absorbed parking lot attendant who was the flash-in-the-pan sensation of 77 Sunset Strip. This is, after all, a guy who spent the last half of his career mostly playing game show hosts (and who very nearly became one himself, before he drank the chance away). You can practically hear Byrnes addressing his ghostwriter: “How much do I need to dish to sell this thing? More? Okay, whatever.” Which would be fine if Byrnes had been intimate with any artists of a higher caliber than Natalie and RJ, or if he had chalked up even a handful of nuanced performances before his career slid into dinner theater. But in these departments Byrnes, alas, falls short, even relative to, for instance, Tab Hunter (whose own book, Tab Hunter Confidential, which I also read this summer, is nearly as bland, but whose talent as an actor remains underappreciated, at least). Ordinarily I wouldn’t go out of my way to beat up on a minor celebrity’s ghostwritten memoir, especially one that’s twenty years old, even one that ends in an addict’s proselytizing embrace of religion as a substitute addiction (spoiler: rather touchingly, the man who dragged Byrnes into AA was fellow Warners contract oaf Troy Donahue, although Byrnes seems oblivious, or perhaps resistant, to the humorous aspect of this support system of has-beens), even one that peddles tales of womanizing suffused with a casual, condescending sexism. But then Byrnes rouses himself from the mediocrity that encircles this whole endeavor – that is, the book as well as the career it enshrines – to make a hilarious, wholly unexpected last-page plunge into jaw-dropping stupidity. An aside of stupidity that I not only don’t feel particularly guilty about mocking but one that also served, for this ungrateful reader, as kind of collapse-into-hysterical-laughter coup-de-grace for this whole wheel-spinning season of migraine-addled unproductivity. Permit me my epiphanies where I find them, okay? No, wait, I have to interrupt myself here and swear on a stack of flop sweat-soaked AA pamphlets that I am not making this up. Really. There. 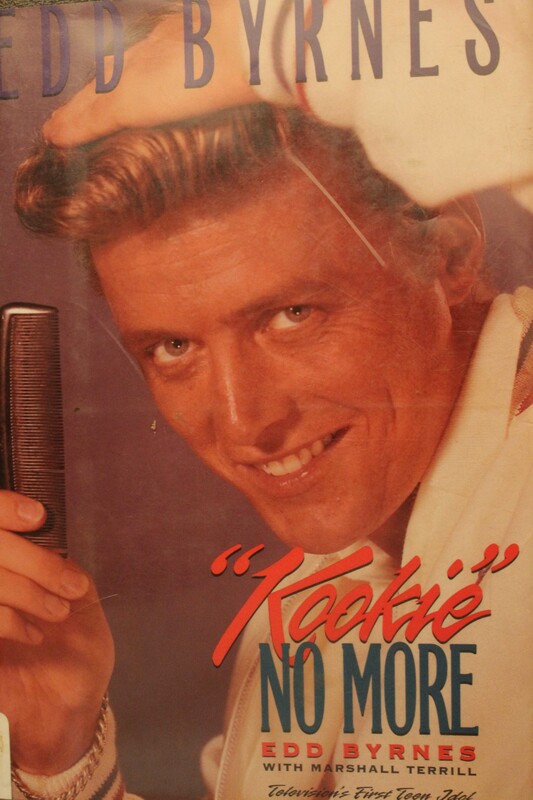 Now you never have to read Edd Byrnes’s “Kookie” No More, because I have done it for you. You’re welcome. And we’ll get back to the serious work soon, I hope. Yesterday The A.V. Club published my interview with Anthony Heald as part of its Random Roles series. In addition to being one of the best character actors working today, Heald is an articulate and analytical person – in other words, an ideal interview subject. I had a great time sharing a long lunch with him last month, and I think the interview turned out pretty well. For the last few months this blog has been more idle than at any earlier time in its seven-year history. Sorry about that! But there is a backlog of half-written material, so we’ll get back on the TV beat soon. This Is The Continuing Story…. Ever since I discovered it ten years ago, one of the series I’ve most wanted to write about in a definitive way is Peyton Place. Most of the truly canonical television series have been identified, if not universally agreed upon, by now. I think Peyton Place may be the one exception – the sole long-running American show that belongs in the pantheon but has generally been excluded. To my great delight, The A.V. Club has given me the opportunity to make a case for its excellence. I’ve also written about Peyton Place in a less comprehensive way in a few other places. After you read the A.V. Club piece, you may want to check out (or revisit) my interviews with writer-producer Richard DeRoy and actor Tim O’Connor, my obituary for director Walter Doniger, and my thoughts on James Rosin’s book about the series. In addition to the four people named in the preceding paragraph, I also want to acknowledge a number of others who spoke to me about Peyton Place over the years: the late Franklin Barton; the late Gerry Day; the late Harold Gast; Lee Grant; Jeffrey Hayden; Patricia Morrow; Ed Nelson; Peggy (Shaw) O’Shea; the late William Self; and Jack Senter. In particular, I’m grateful to the late Del Reisman, who spent many patient hours discussing this and other shows with me over the course of several years, and to Sonya Roberts, an off-the-record friend of long standing who finally and graciously consented to become a source for this piece. As was the case with Ben Casey, there will be a few sidebars here during the next few weeks to showcase some of the research that didn’t make it into the A.V. Club essay.